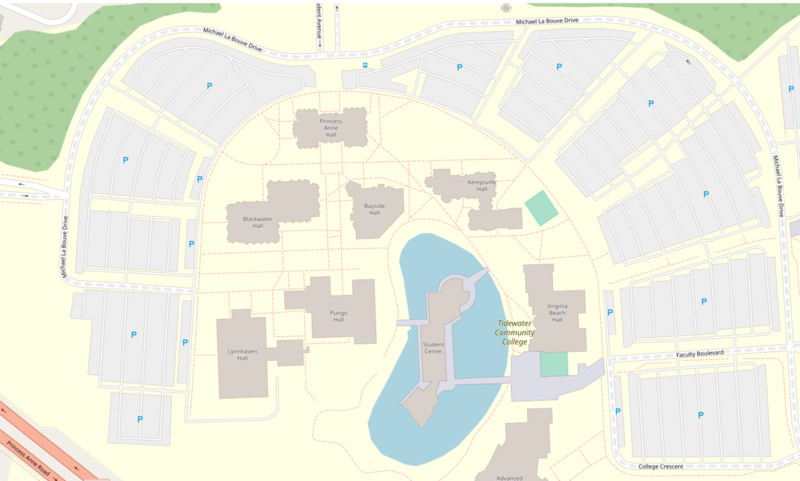 Using Google Maps give the destination address as "Tidewater Community College Virginia Beach Campus"
Enter the campus from your choice of Community College Place, Faculty Boulevard, or Student Avenue. Turn right onto Michael La Bouve Drive. If parking for class, continue toward the Lynnhaven Hall and park in lot 1 or 2. Proceed down the walkway beside the Lynnhaven Building to reach the Pungo Building. If entering from Community College Place, turn left onto Michael La Bouve Drive. If entering from Faculty Boulevard or Student Avenue, turn right onto Michael La Bouve Drive. Continue to the Princess Anne parking lot 3. Flags and the dolphin sculpture are outside. See the Quarterly Schedule for specific class location.